My Go-To Products For When I'm Feeling Run Down. | By Millie. LUSH Butterbear Bath Melt: A nice bath wouldn't be complete without some kind of bath bomb or bubbles. I adore this bath melt from LUSH as it's so hydrating on the skin and feels super luxurious to use. The smell is a very nice, sweet vanilla scent topped off with some Shea butter, it's truly glorious. It's exactly what my body needs after being in bed all day. 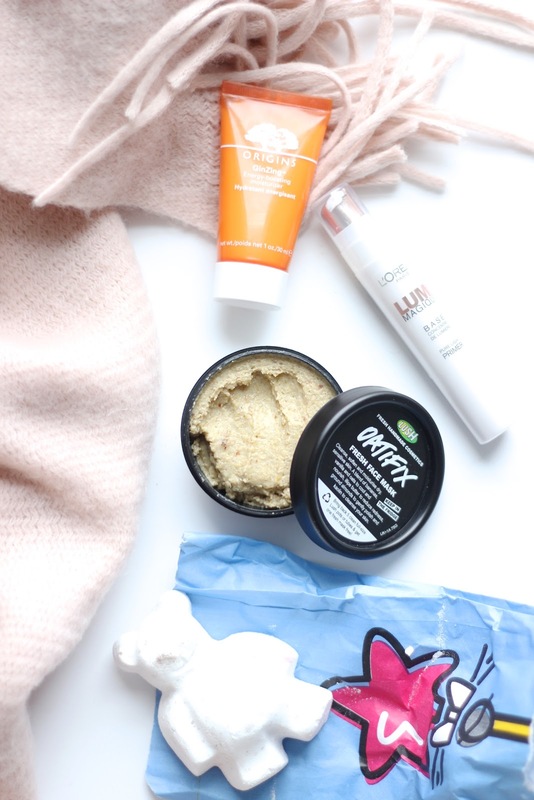 LUSH Oatifix Face Mask: I also love to use a face mask to hydrate and rejuvenate my skin. I really like Oatifix from LUSH, the smell is very subtle and it's completely natural making it good enough to eat - but don't. The oats make this slightly exfoliating and leave my skin feeling so soft. Origins GinZing Moisturiser: I still like to do somewhat of a skincare routine, even though I may miss out a few steps, as it makes me feel so much more human. I always reach for a brightening moisturiser which is going to wake up the skin. This Origins one smells amazing and is a gel formula so it adds a lot of hydration to the skin. L'Oreal Lumi Magique Primer: My skin always lacks glow when I'm ill so I like to add that back in as best I can. Primers are a great way to make your skin look plump, and dewy, but without having to do a full face of makeup including highlighters etc. I love this L'Oreal one, it's super similar to the Dior Glow Maximiser which is one of my favourites. It's more of a pearl shimmer, than golden, but it adds such a nice sheen to the skin and makes you look healthy and refreshed.